On the outskirts of Paracatu, a small city in the eastern Brazilian state of Minas Gerais, lies the country’s largest gold mine, known by locals as Morro do Ouro. The mine, which began production in the 1980s, has undergone a dramatic expansion since 2006 under the ownership of Canadian company Kinross Gold. This report, a joint effort of Above Ground and Justiça Global, documents how the expansion of the Morro do Ouro mine negatively impacted the lives, land and livelihood of local people. It is based on a multi-year study in which our researchers interviewed local residents and public officials, spoke with representatives from Kinross and combed through government reports, news articles and court documents. Their research reveals serious human rights violations linked to the expansion of the mine over the past decade, a period during which Kinross received substantial and repeated financial support from the Canadian government. The story of Morro do Ouro provides a compelling illustration of the governance gap that often surrounds the overseas operations of Canadian multinational companies. It follows a pattern widely seen throughout the world, in which host-state governments fail to protect people’s rights in the context of large-scale resource development projects. Canada, in turn, has no effective laws or policies in place to prevent or remedy harms caused by Canadian companies — including those it directly finances — in their operations abroad. Those most directly harmed by Kinross’s expansion project were the quilombola, people of African descent living in three nearby rural settlements founded by freed slaves in the 19th century. Quilombola communities hold legal ownership rights over their traditional lands. The three communities — Machadinho, Amaros and São Domingos — had been formally recognized by the federal government as quilombola and were engaged in a land claim process to secure collective title to their territories when Kinross assumed ownership of the mine in 2004. The quilombola residents with whom our researchers spoke said they entered into such agreements without legal advice. At least one was illiterate. Some quilombola also claim that Kinross promoted divisions within their communities and isolated leaders who criticized its actions. One community leader reports receiving anonymous death threats that she believes are linked to her criticism of the company. Kinross asserts that it acquired land within the quilombola territories legally, through fair negotiations with each family, and that quilombola residents who abandoned their traditional land did so voluntarily, renouncing all rights to the area. The Brazilian federal government put a hold on all three communities’ land claims processes in 2009, while the licensing process for Kinross’s project sped along. Two public ministries — independent bodies of public prosecutors charged with upholding constitutional rights — filed lawsuits attempting to halt licensing until quilombola rights were addressed. While both succeeded in securing injunctions, these were overturned by higher courts due to the communities’ lack of formal title to their lands. Kinross proceeded with its expansion project, rendering large areas of quilombola land unsuitable for occupation or use. No quilombola remain within the territories of Machadinho and Amaros. The matter of the three communities’ land rights has never been settled. Serious conflict and safety concerns have arisen in relation to periodic attempts by locals to extract remnants of gold left in the mine’s tailings. Security guards at the mine have reportedly used armed force on people covertly entering the mine site, killing two young men in 1998. People have also died inside the mine’s waste effluent pipes, which they enter and sometimes become trapped in. Four men were found dead in the pipes in 2016. Another was found dead at a tailings dam in February 2017. Disputes have also emerged between the company and nearby residents disturbed by the noise, vibrations and dust from near-daily blasting operations at the mine. Hundreds of homes are located within 500 metres of the open pit. Residents complain of property damage, which they attribute to the blasting. Some say they want to move away but are unable to sell their homes. In a series of lawsuits, two public ministries have exposed critical deficiencies in the environmental oversight of the mine. Environmental authorities considered and approved a new high-capacity plant as a separate project from the tailings facility needed to contain the resultant waste. They have allowed Kinross to monitor its own air and water emissions. Residents of Paracatu have long expressed concern about potential health risks posed by the high arsenic content of the ore processed at Morro do Ouro. Several studies of local arsenic exposure and health risks have been carried out, with researchers coming to a range of disparate conclusions. A study commissioned by the city determined that although arsenic levels in drinking water sources are well within safe limits, residents face an unacceptable risk of carcinogenic effects once all air- and water-based exposure pathways are taken into account. A second study, commissioned by Kinross, found the bioaccessibility of arsenic in local air and water to be low, and concluded that the overall health risk posed by arsenic exposure to the general population is low. In contrast, a study carried out independently by a local geologist reportedly found arsenic levels exceeding safe limits in waterways downstream of the mine and in the urine of nearby residents. Since Kinross acquired the Morro do Ouro mine, the Canadian state has provided the company with up to $850 million in financing through its export credit agency, Export Development Canada (EDC). Kinross received five EDC loans between 2012 and 2017, long after Brazil’s federal public ministry had called attention to the violation of quilombola rights in the expansion of the mine. The Canadian government also supports Kinross financially through the Canada Pension Plan, which holds an equity interest in the company worth $60 million, and politically through its embassy in Brazil. The substantial public support lent to Kinross despite the problems documented at Morro do Ouro reveals the need for more effective policies and mechanisms in Canada to assess environmental and human rights risks associated with the operations of companies receiving government support. This report concludes with a series of recommendations aimed at ensuring that both Canada and Brazil meet their international obligation to protect human rights in the context of large-scale extractive projects undertaken within their territory or by companies under their jurisdiction. establish a duty of care on the part of public institutions towards those directly affected by their clients’ operations. Our recommendations to Brazilian authorities include the immediate suspension of Kinross’s mining activity at Morro do Ouro until applicable legal norms and constitutional rights are respected. 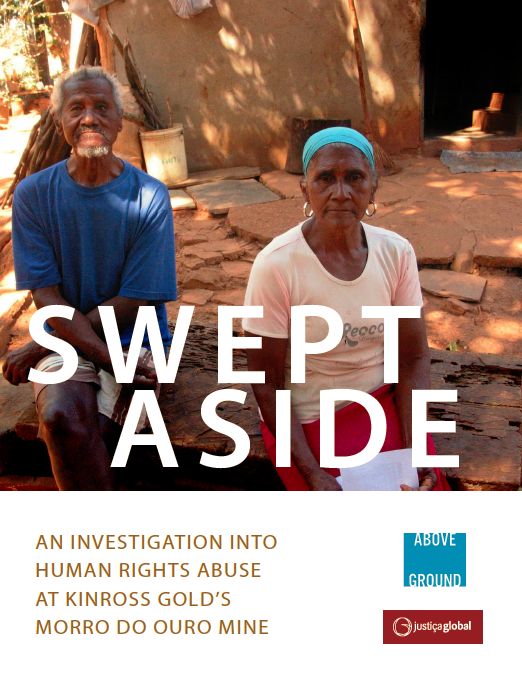 In February 2018, the Business & Human Rights Resource Centre posted the Swept Aside report on its website, along with responses from Kinross Gold and Export Development Canada. In March, Above Ground and Justiça Global released this statement to address points raised in Kinross’s and EDC’s responses.